The Rio Blanco Water Conservancy District (RBWCD) is as busy as ever with many projects in the works that affect residents on both ends of Rio Blanco County. District Manager Alden Vanden Brink explained that the board is in the pre-permitting process for the White River Storage Project. “They are getting organized enough so that they can go into permitting. Their goal is to be in the permitting process at this time next year in 2020,” Vanden Brink said. 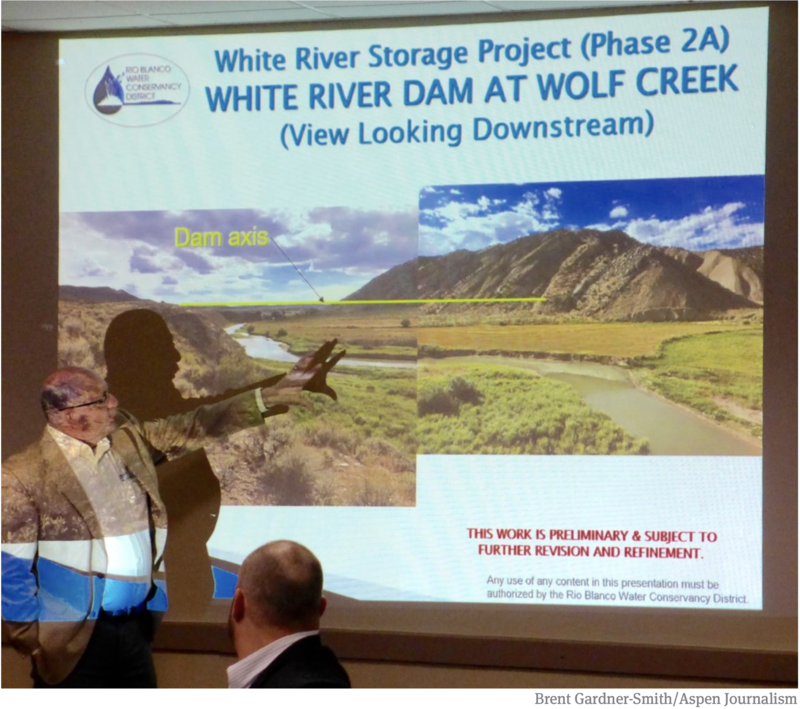 According to the Rio Blanco Water Conservancy’s website, the Northwest Colorado Water and Storage Project, also known as “Wolf Creek” has been in water resource planners’ sights since the 1940s when it was first proposed. Since then it seems every 10 years or so interest in the project is renewed and a feasibility study is completed. After reviewing all the pieces involved in reservoir construction the Wolf Creek project appears to make perfect sense for a White River reservoir. This is due, in part, to the potential for a significant portion of water to be stored off of the main channel, even with the main-stem White River dam. The geology of Wolf Creek and the surrounding area allows the inundation areas for the main-stem versus off-channel dam to be very similar. The Wolf Creek area also has the advantage of having all necessary raw materials available on site for the construction of the dam. Estimates of the reservoir’s potential capacity are still in the development stages, but all indications point to a minimum reservoir capacity of 20,000–30,0000 acre-feet (AF) to 90,000 AF of storage with a maximum build capacity of stored water up to 1.2 million AF. This is the only basin or main tributary to the Colorado River in the state that does not currently have drought resiliency. This project is a response to a developing water crisis for the lower White River including the Town of Rangely. No private lands will be inundated by this project as the location sits on federal, state and private land. That private land belongs to the Rio Blanco Water Conservancy District. Not only will this project help the water storage crisis on the White River, Vanden Brink asserts “the local and regional economy will be enormously impacted and stimulated by the construction of this project.” The public can look forward to updates on the project as they develop. 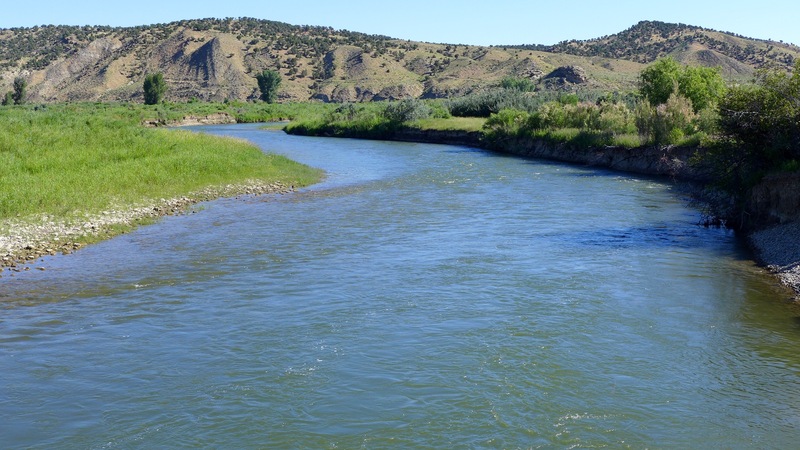 The popular annual Rio Blanco Water Conservancy District Fishing Derby is set for June 1-2 this year. This event coincides with Colorado Parks and Wildlife’s free fishing weekend. The conservancy district offers free camping at Kenney Reservoir that begins Friday, May 31 and is honored on a first-come, first-serve basis. The weekend is also a free boating weekend a the reservoir. “The Rangely Area Chamber of Commerce will be executing a Visit Rangely promotion during this time as well,” Vanden Brink said. The investigation into the problematic algae bloom in the White River is ongoing. A group of concerned citizens and agencies have convened to address the excessive amount of algae in the White River from the headwaters to the Utah state line. The Technical Advisory Group includes the Rio Blanco Water Conservancy District, Colorado Parks and Wildlife, Colorado River Water Conservation District, Rio Blanco County, Town of Meeker, Town of Rangely, Meeker Sanitation District, White River Conservation District, Douglas Creek Conservation District, Natural Resource Conservation Service, US Forest Service, Bureau of Land Management, U.S. Geological Survey, and Trout Unlimited. According to Colorado Parks and Wildlife, in 2016 the visible filamentous alga was identified as Cladophora glomerata. All water users on the White River are impacted by this algae growth. It has especially caused intake problems for water users such as The Town of Rangely as well as private land owners. The RBWCD financially contributes to this investigation which hired the U.S. Geological Survey last year to conduct the water quality and stream morphology investigation. Vanden Brink reports that the RBWCD had success in 2018 flushing water out of the dam into the lower White River which helped to alleviate some of the algae problems in that area. They intend to use that method again in 2019 but likely earlier in the year. Taylor Draw Dam was constructed in 1983 to create Kenney Reservoir. One hundred percent of the dam was funded by the taxpayers of western Rio Blanco County, including the Town of Rangely. In 1993 a 2-megawatt hydroelectric generator was added. The generator is capable of variable power output matching the flows of the White River. At full power production capacity, the hydroelectric facility provides up to 30 percent of renewable energy for Rangely. The energy created goes immediately onto the energy grid. 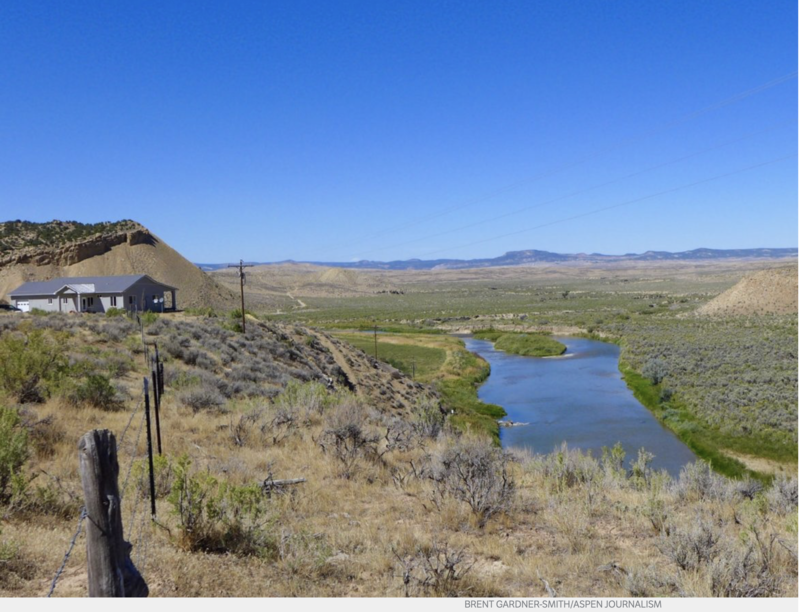 The Rio Blanco Water Conservancy District will meet again on Wednesday, March 27 at 6 p.m. The White River, in the vicinity of the proposed Wolf Creek Reservoir. Photo by Brent Gardner-Smith/Aspen Journalism. Members of the White River Algae Technical Advisory Group (TAG), met Feb. 13 to discuss the 2019 plans to ascertain what is driving the algae growth in the White River to improve the overall health of the watershed. Callie Hendrickson, executive director of the White River and Douglas Creek Conservation Districts facilitated the meeting. USGS provided a review of 2018 studies and planned 2019 activities. 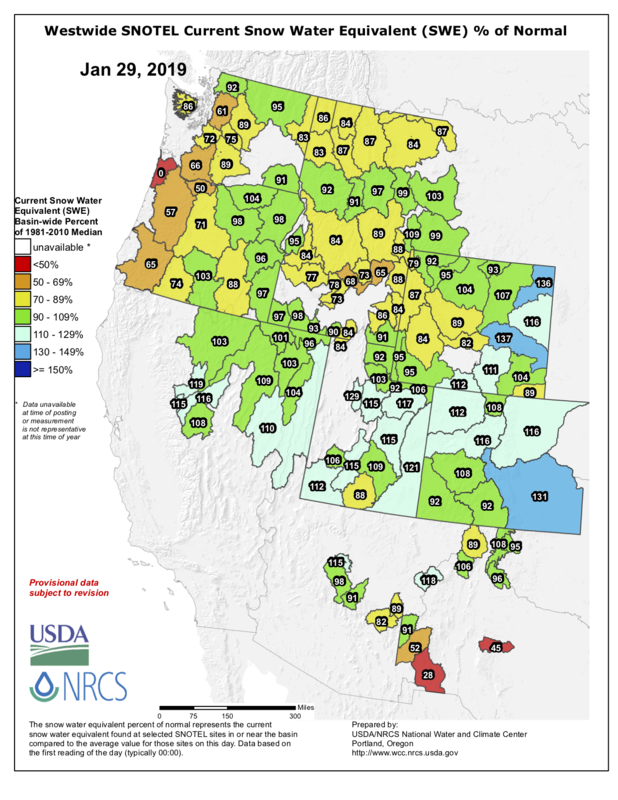 Ken Leib, Western Colorado Office Chief, stated their goal is to document and understand benthic algal occurrence, characteristics and controls at multiple locations within the White River (WR) study area and described the study design and approach. Cory Williams, Western Colorado Studies Chief, reviewed the historical analysis, water quality trends, algae sampling and isotope sampling. Key takeaways are as follows. Historical streamflow analysis showed a decreasing trend in flow patterns since 1900 while available high-resolution water temperature data indicates increasing daily mean temperatures during May-September between two more recent time periods (1979-84 and 2007-17). Little to no change has been shown in the mean, annual concentration of kjeldahl nitrogen while total phosphorous showed a substantial increase in concentration and flux between 1999 and 2017. Concentrations in phosphorous increased during snowmelt-runoff (high flow) and decrease during fall and winter months. Several types of algae were present at each study site and Cladophora was found at all 19 USGS study sites. Water samples were collected and analyzed for nitrate concentrations at six locations but, concentrations were too low for isotope analysis. Isotopic analysis is an aspect of the study intended to aid in identification of sources of nitrate in the watershed. Sampling and nitrate analysis are ongoing and USGS is exploring alternative sampling approaches to meet target concentration ranges. Historical analysis and literature review, physical and chemical characterization/data collection, algae sampling and isotope sampling will all be continued in 2019. Tyler Adams, project manager, and Susan Nall, section supervisor, with the Army Corps of Engineers (ACE) reviewed permitted activity in the recent past. They described their regulatory authorities and explained how to know when a project is regulated and when it may qualify for exemptions. Available permits vary from Nation Wide Permits (NWP) to Regional General Permits (RGP) to Individual Permits (IP). Permitting history in the Upper White River total 53 permits (NWPs=38, RGPs=14, IP=1), about 866,939 acres, from 2008-2018. Matt Weaver, 5 Rivers Inc. gave a presentation on a local project proposal that is currently in the application process with the ACE. The proposal is to enhance fish habitat in the White River. The plan is to create 18 pools in which Weaver will remove material from the pool area and add it to the bank to leave everything functioning as a pool-bar sequence. Weaver and the landowners are communicating with the Colorado Parks and Wildlife to avoid disrupting crucial times such as spawning season, etc. One USGS study site is encompassed in the project area. The landowners/managers are willing to work with the TAG and USGS to do their best not to affect the ongoing study. Several discussion items were identified at the last TAG meeting as potential changes to the USGS 2019 Scope of Work (SOW). Items such as monitoring growth of the algae using pictures, isotopic analysis, water temperature monitoring, taxonomy, capturing the impacts of stream structure changes, water clarity (turbidity) and quantitative mapping were reviewed to make decisions on how the TAG would like to move forward. 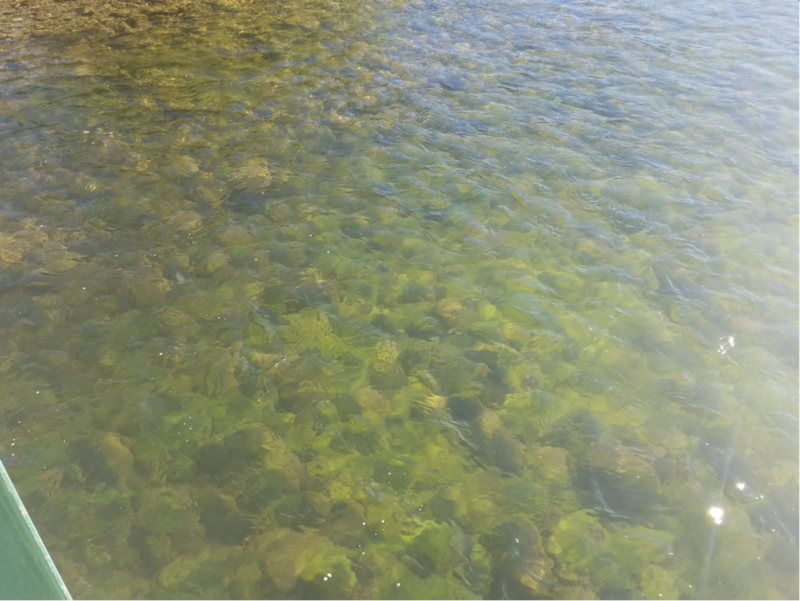 After this discussion, the TAG reached a consensus that the White River Conservation District should move forward with the original agreement with USGS to continue the 2019 SOW for the White River Algae project. That SOW includes the workplan elements: Scouring flows and analysis and Pre, peak-, post-algae and water quality sampling events. See http://www.whiterivercd.com/white-river-algae-working-group.html for Power Point Presentations and meeting notes. Click here to go to the website to RSVP and read the agenda. The public is invited to attend the Water Expo and White River Conservation District Annual Meeting to hear and engage in discussions with speakers about the Colorado River Water Compact, Prior Appropriations Doctrine, Demand Management, Protecting your Water Rights, and Integrated Water Management Plans. Speakers include Colorado River District General Manager Andy Mueller, Colorado Water Conservation Board’s Interstate, Federal, and Water Information Section Chief Brent Newman, Division 5 Water Referee Susan Ryan, and several water rights attorneys, who will discuss these topics with Rio Blanco citizens. See the full agenda at the White River and Douglas Creek Conservation Districts’ website, http://whiterivercd.com. Registration is at 9:30 a.m., and the expo is expected to wrap up by 4 p.m. Lunch will be provided by the Colorado Ag Water Alliance with an RSVP. To RSVP or for more information, contact the Conservation District Office at 970-878-9838 or whiterivercd@gmail.com. Petroteq Energy, formerly MCW Energy Group, has built a facility at Asphalt Ridge outside Vernal and is using what it says are benign solvents to produce oil from oil sand deposits. The company says its approach uses no water, produces no waste or greenhouse gas and doesn’t require high temperatures. It is working to ramp up production to the plant’s capacity of 1,000 barrels a day. Oil sands are also known as tar sands or bituminous sands, and contain a heavy oil also described as asphalt or bitumen. Petroteq’s project is at Asphalt Ridge, which the federal Bureau of Land Management has reported has been the target of oil/tar sand exploration and development efforts as early as the 1920s, when Vernal paved its streets from Asphalt Ridge deposits. Work there included a plant that used hot water to extract oil in the 1930s. Hot water also is used in Canadian tar sands development that also incorporates tailing ponds. “Our ‘Asphalt Ridge’ asset has (from time to time) caught the attention of major oil companies going back 70 years. But nobody has been able to unlock its resources in a financially sound and environmentally friendly manner until the Petroteq team and its proprietary technology came along,” David Sealock, Petroteq’s chief executive officer, said in a recent news release announcing the company’s start of commercial production. The company says its focus is on development and implementation of proprietary technologies for environmentally safe production of heavy oil from oil sands, oil shale and shallow oil deposits. 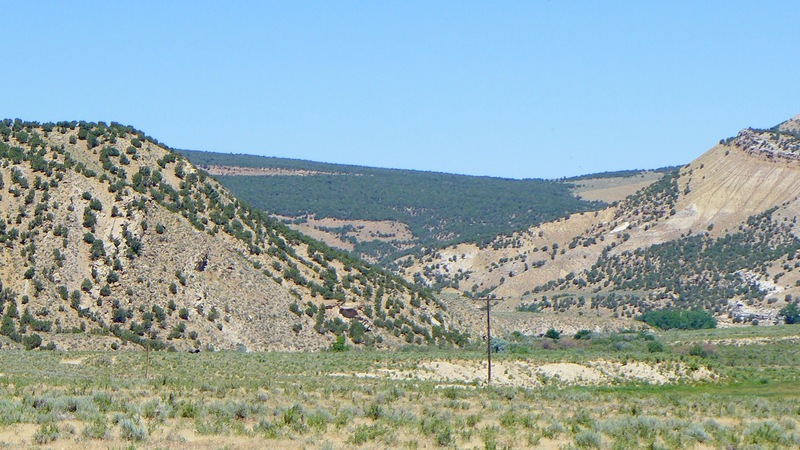 Northwest Colorado and northeastern Utah are home to world-class deposits of oil shale, rock containing kerogen-like hydrocarbon deposits. The Rio Blanco Water Conservancy District wants to build the reservoir northeast of Rangely on Wolf Creek, a tributary of the White River on the Moffat County border, and pump water from the White River to fill it. The district is looking at two options, one with a working pool of 20,000 acre-feet, the second with a working pool of 90,000 acre-feet, at estimated costs of $119 million and $191 million respectively. The district envisions the reservoir meeting a variety of uses, including providing water to the town of Rangely, supporting oil and gas and oil shale development, providing water for endangered fish, and serving as a recreational attraction. In terms of total size, it is considering a reservoir holding 41,000 or 130,000 acre-feet of water. That would account for an additional nonworking pool that would continue to serve recreation needs at times of low water, provide an insurance water supply in circumstances such as during work on the pumping system, and make room for accumulation of silt. The problem of sedimentation has beset Kenney Reservoir, which sits upstream of Rangely on the White River. That is threatening its viability as a continued source of water for Rangely and as a recreational amenity. Dredging the reservoir would cost an estimated $700 million. Siltation is expected to be less of a problem in the case of a Wolf Creek reservoir because it’s off the main White River channel and the water would be pumped into it. Rio Blanco Water Conservancy District officials discussed their proposal in Glenwood Springs last week with the board of the Colorado River District, a taxpayer-funded entity consisting of 15 counties. 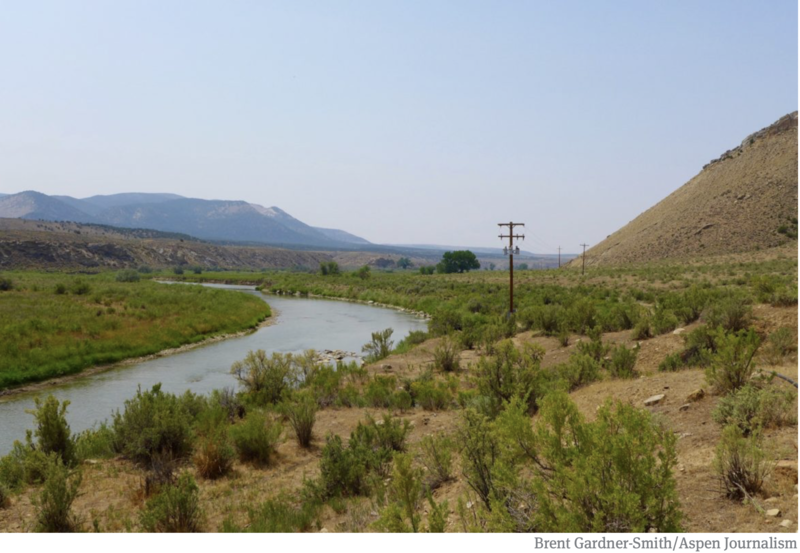 The Rio Blanco district is hoping the river district will contribute $50,000 toward the cost of seeking permits for the project, which would be built largely on federal Bureau of Land Management land. It’s also seeking technical and other support from the river district. The district plans to pursue funding from potential users and other sources such as the federal and state governments to pay for the project.